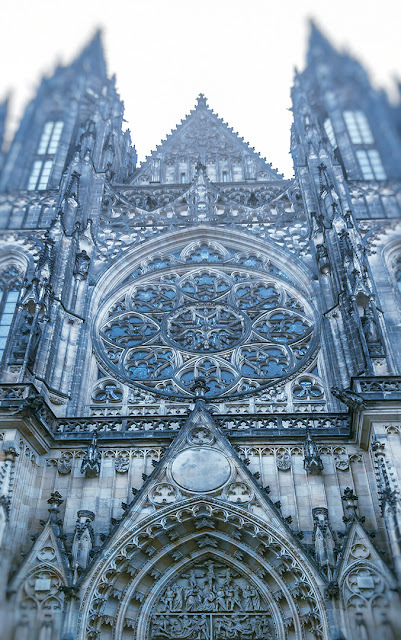 It was our second time to visit the St Vitus Cathedral in Prague. The first was in April 2013. I showed Rose this image and she wondered why the building was blue. I supposed it should be more grayish but that was how my iPhone 7 plus captured it. I thought it looked cool that way. It was freezing cold that morning. It was only 33 degrees F but it felt like low 20s because of the wind. I was foolish to not bring my scarf and did not double up on my sweater. Rose and I had to share her scarf. So we were going around like a Siamese twin. The cathedral is Roman Catholic like most religious churches in Prague. The last time we weren't able to go in because there was a service. This time we were more fortunate. Our guide told us that many Bohemian kings and Holy Roman emperors were buried here. Although from the outside, the architectural style is undeniably Gothic, the interior is different. It was a mixed of Renaissance and Baroque. That's because it took years for the inside to be completed. Through years of work, different architectural styles have evolved. Regarding this picture: At times, I'm asked why I blur my images. That it may look nicer if it's not blurred. For this image, I am not sure if it would look any nicer without the blur. Besides I would rather that people appreciate my image because it's artistic rather than nice. Without the artistic effect, it would look like just any other architecture. Maybe nice but nicely boring in my opinion. Most viewers perceived blurred images as accidents or were captured because of sloppy techniques. I think that is unfortunate. And yet there is an underlining and significant philosophy about blurring technique. Consider the Impressionist paintings. Apparently, those painters were harshly criticized for their work. Years later, they were heralded as geniuses. Perhaps, when I'm gone people will see my work as genius. You think?